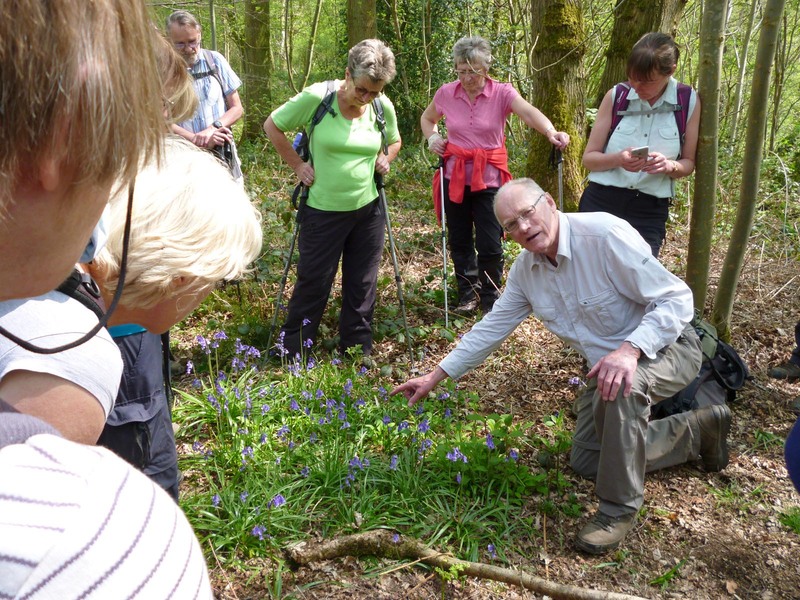 Professor Handley explains that Cotterill Clough is noted for native wild bluebells. East Cheshire ramblers were privileged recently to see a traditional, natural woodland in all its spring glory and receive an expert account of its flora and fauna from walk leader John Handley, Professor Emeritus of Planning and Environmental Management at Manchester University and a long term member of ECR and Cheshire Wildlife Trust. Cotterill Clough near Manchester Airport was acquired by public subscription to celebrate the memory of TA Coward, a great Cheshire naturalist and writer. In his book, Life of Wayside and Woodland, he described May as ‘the height of spring, the acme of the observer’s desire’ and remarked somewhat wistfully that there is only one month of May each year. Indeed, the Cheshire beauty spot was at its best with wild cherry blossom in the tree canopy, sheets of scented bluebells below and a riot of wild garlic and golden saxifrage above on the lower slopes of a burbling stream. 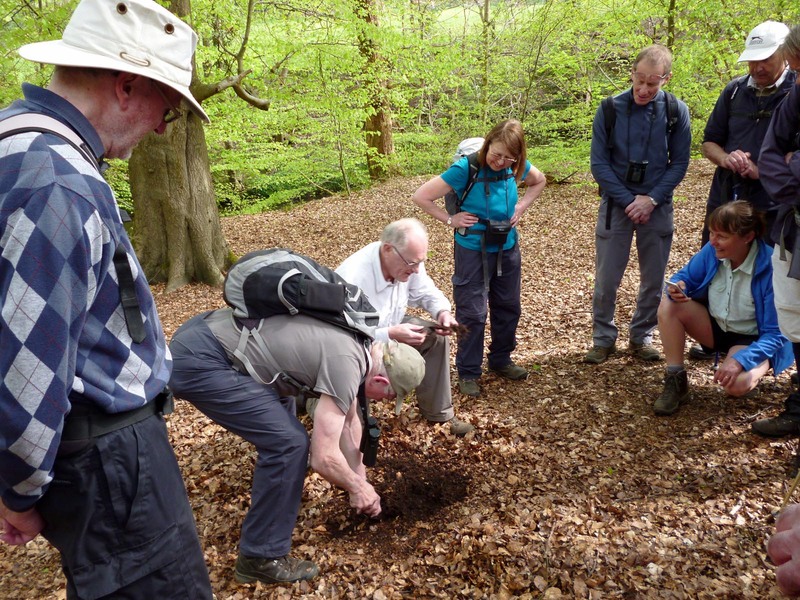 Discussing the eco system of tree roots in a beech wood at Styal Country Park. Access to the nature reserve, which is managed by Cheshire Wildlife Trust, is carefully controlled to preserve its special qualities and the 26 ramblers present were fortunate to get their own exclusive viewing at such a special time of year. 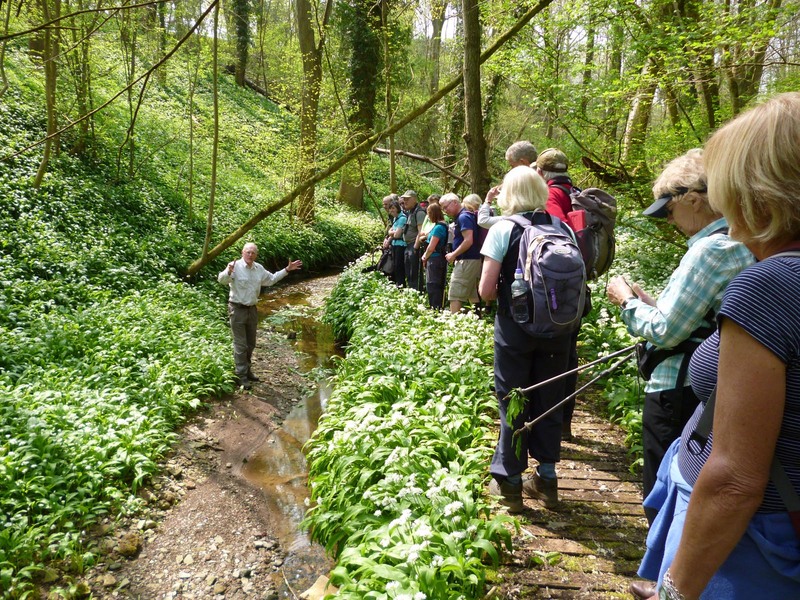 Professor Handley with fellow ramblers in Cotterill Clough surounded by a sea of wild garlic.